Just about everyone I know hankers after a honest-to-god Turkish kebab from time to time, but how many of us are kebab literate? If your appetite runs in this direction, do yourself a favor – discover the variety and flavorsome characters of the many different kinds of kebabs that are out there, or yours for the making. If there’s a good kebab joint in your area, save yourself the confusion by checking out the range of kebabs that may be on offer, and make an ‘educated’ choice when you make your next order. There are quite a few to choose from, and they’re as delicious as they are different. Maximize your Turkish taste sensation by having a look at the list below. Forget your late-night, generic kebab shop disasters. This stuff is the real deal. A cross between a stew and a pie with meat, pearl onions and vegetables cooked in a clay pot then sealed with dough (no testes were harmed in the making of this kebab). 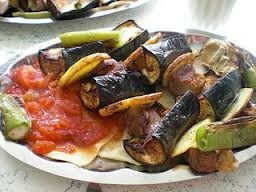 Veal, potatoes, eggplant, tomatoes, onion and garlic in pita bread. Thin strips of lamb piled on a pita bread and topped with spicy tomato sauce, butter and yoghurt. Döner usually refers to the meat that sits in on a large, vertical, rotating skewer and is cooked over hot coals. It looks a bit like a baby elephants leg. Traditionally eaten either in pita or on rice, with salads and hummus. Made with mince instead of chunks of meat – the adana kebab is a little different from its delicious cousins. It’s also usually pretty spicy – so be sure to ask for an urfa kebab (the non-hot version) if spice isn’t your thing. Grilled meat served on a pide with garlic, tomato, yoghurt and mint. Really good.